For those who like DIY, it is very interesting to create a cluster. With the appearance of Raspberry Pi, the cost of building a cluster is drastically reduced and many examples of using the Raspberry Pi to create clusters can be found on the Internet. However, at present, a Raspberry Pi 3 still costs USD 35 or more, if you can build a cluster with a smaller machine, such as ESP32, so the cost of each node will only costs USD 7 or so. Under the same budget, the lower the cost of a single node is, the more nodes can be, and it will be more ideal for some purposes. There are many existing communication and software platforms, such as Kafka, Dask, Ipython Parallel, Celery, MQTT, etc., which can be used as a mechanism of communication and integration for cluster and distributed systems. There are many common design patterns, for example: controller/master/broker corresponds to nodes/workers/clients, the message queue and message-passing interfaces, and the paradigms of producer/queue/consumer or publisher/topic/subscriber. With these all combined, it is possible to build an elastic and robust computing platform for distributed/parallel operations. Celery is one of the famous examples. Celery operates in a producer/queue/consumer paradigm. It is used with some suites (eg RabbitMQ, Redis...) which follow the AMQP protocol. The mechanism is described in details in the Celery documents. Please also refer to this easy-to-understand articles. Celery provides a sub-module called Canvas. With Canvas it's easy to organize tasks into workflow and dispatch it all at once to workers for processing. The client only needs to wait for the final result. I was very curious and interested in its souce code. Therefore, the goal of this project was set as: Creating a package, with which we can, in a Celery-Canvas fashion, dispatch tasks to an ESP32 cluster for processing. With ESP32 as a hardware platform, the cost of construction is low. Each ESP32 node is actually a combination of broker + task queue + worker. There are as many brokers as nodes. Each ESP32 node is actually a combination of broker + task queue + worker. Nodes are identical in structure. Each node can push tasks into its task queue, and dispatch tasks to other ESP32 workers in the cluster. ESP32 has built-in WiFi functionality. Nodes communicate via. MQTT protocol, and can be integrated with existing MQTT-based system easily. We can pack functions that need to be executed into a module.py file and dynamically deploy it to each node of the cluster via wireless network. Workers can then perform new functions. Support mechanisms similar to Celery Canvas for organizing tasks. Chords: joins two operations, the first one being a Groups. The result ofgroupoperation will be passed to the operation in the second parentheses, as a parameter. 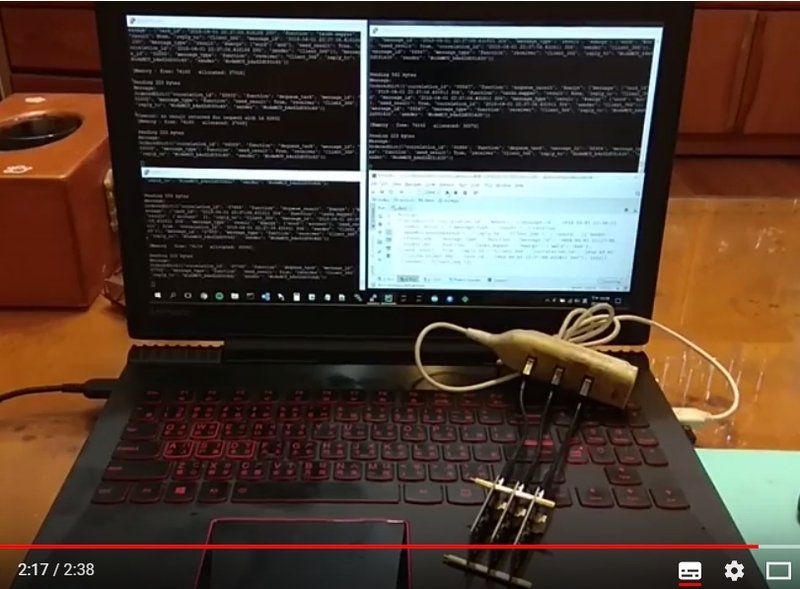 - The PC executes a client program to dispatch tasks to a cluster consisted of three ESP32s. Please refer to the following video for description. - Please also refer to the Jupyter notebook for testing for more detailed tests. - If you faced CPU-bound problems, ESP32 cluster is less powerful than multi-core CPUs running multi-processes. - If you faced IO-bound problems, ESP32 cluster is less powerful than multi-core CPUs running multi-threads. coordinate a system with parts separated far away, for example a robot a mile wide, a mile long. with the low cost and flexibility of deploying, ESP32 is preferable than an ordinary PC or Raspberry Pi.